Roast leg of lamb is one of my absolute favorite meals. I love lamb anyway, but roasting seems to bring out the best in it. This particular recipe is adapted from several Greek recipes and features traditional flavors like lemon, garlic, and rosemary. 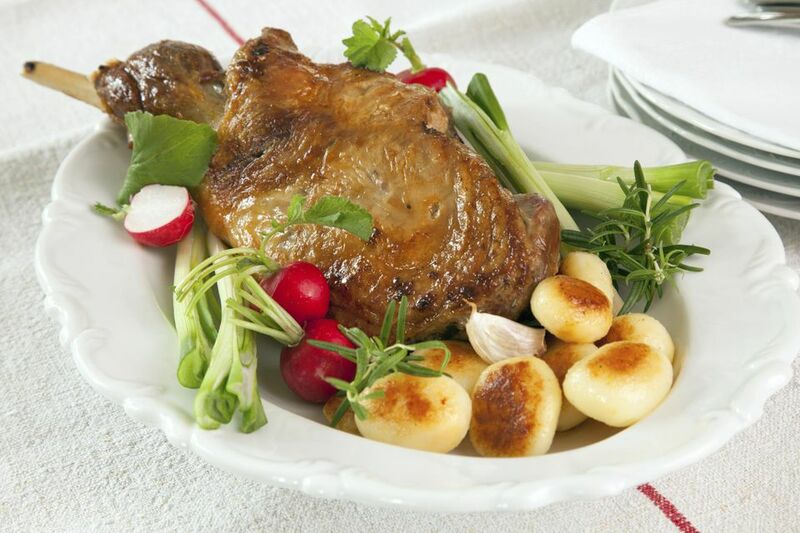 Although the photograph is of a whole, bone-in leg of lamb you can also find smaller boned legs. In a small bowl, thoroughly combine lemon zest, thyme, oregano, salt, and pepper. Brush lamb with lemon juice, then olive oil, then massage in herb/seasoning mixture. Position leg on a rack in a roasting pan and roast until an instant-read thermometer reads 130 F for medium rare or 140 for medium (2 to 2 1/2 hours depending on your oven). Remove from oven, tent with foil, and let rest for 15 minutes. Meanwhile, heat oven to it's the highest setting. Return roast to oven and cook until well-browned, about 10 to 15 minutes. Serve topped with tzatziki sauce or gremolata. Stuff thin slices of lamb into pita bread with lettuce, onion and tzatziki sauce for an ad hoc gyro. Or, you can make a Greek shepherd's pie or pastitsio.